Boston Massachusetts, USA - Wednesday January 25, 2006. At the ceremony for the 2005 Free Software Awards, Richard Stallman presented Andrew Tridgell with the award for the advancement of free software. Andrew “Tridge” Tridgell was recognized for his work as originator and developer of the Samba project. Samba reverse-engineered Microsoft's version of the Server Message Block (SMB) protocol, which is used for file-sharing and print services. This software enables free operating systems to fit into Microsoft-based environments, encouraging greater use and adoption of free software. Samba has been implemented on millions of servers throughout the world. Tridge also released rsync, a highly respected remote file-distribution system, and contributed code to the Linux kernel. During 2005, Tridge wrote a free software client to interoperate with BitKeeper, a proprietary revision control system used at the time by the Linux kernel developers. His reverse-engineering efforts led BitMover Inc. to remove permission for the use of BitKeeper, paving the way for a free software replacement. The Linux kernel is now being developed using a revision control system called Git, begun by Linus Torvalds and licensed under the GPL. Every year, three finalists are nominated for the award by the free software community. This year's other two finalists were Harmut Pilch, recognized as founder of Foundation for a Free Information Infrastructure (FFII) and for his leadership during the fight against the Software Patent Directive in Europe, and Theodore T'so, recognized for his work on file systems and the Linux kernel. This year's Award Committee: Peter H. Salus (chair), Richard Stallman, Alan Cox (winner 2003), Lawrence Lessig (winner 2002), Guido van Rossum (winner 2001), Vernor Vinge, Frederic Couchet, Jonas Oberg, Hong Feng, Bruce Perens, Raju Mathur, Suresh Ramasubramanian, Enrique A. Chaparro, Ian Murdock. 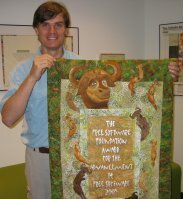 The Free Software Foundation sponsors the annual Award for the Advancement of Free Software, to recognize and honor those that have made a great contribution to the progress and development of Free Software (free as in freedom as defined in the Free Software Definition), through activities that accord with the spirit of software freedom. Any kind of activity could be eligible—writing software, writing documentation, publishing software, even journalism—but whatever the activity, we want to recognize long-term central contributions to the development of the world of software freedom. “Accord with the spirit” means, for example, that software, manuals or collections of them (online or on CD) must be entirely free. Work done commercially is eligible, but we give this award to individuals, not to companies, organizations, or teams. You can support the award and the work of the Free Software Foundation here.